The idea of the spice mixture is use what you have. I used bay leaves, nutmeg, mace, cardamom, cloves, ginger and long pepper. What I ended up doing was mixing 4 parts of ginger powder to 1 part of all the other dry ingredients. This gave me a sweeter spice. I blended all dry ingredients into a food mill and really ground down this mixture. You can play with the different ingredients that are listed on the site, adding lavender, rose, and other items. I was fairly light handed on using this in the dish as well. It’s a unique flavoring that gives the dish a very floral freshness. If you don’t want to add this, you do not have to either. The dish stands on its own. This is on page 66: “Get some carrots, the white part of leeks, sesame butter [tahini], wine vinegar and atraf-tib. Slice the carrots and boil them. Take the [green] tops of the leeks and boil them separately, then drain them and soften them in sesame oil. Put the tahina in a dish, sprinkle it with boiling water, and mix it by hand so that the sesame oil can express itself; then add little vinegar, honey, and some atraf-tib. Put the drained carrots and leeks in a serving dish and add the tahini. You must do [this] in such a way that the quantity of carrots and leeks suits that of the condiments. Clean and slice vegetables, cutting them so the slices are uniform, both vegetables should have the same sized pieces. Put together two cook pans, adding water and some salt (around a tbsp.) to both, and bring to boil. In one boiling pot, add the cut carrots and blanch them. In the other pot, add the leeks to blanch. You want to try to keep a bit of a bite on the vegetables. Make sure when you pull the vegetables out of the water that they go immediately into an ice bath to stop them overcooking. Drain vegetables and add all ingredients into a mixing bowl and combine. Serves 6. Medieval Cuisine of the Islamic World by Lilia Zaouali (ISBN: 978-0-520-26174-7) was used for this redaction. Recipes from the book with the donation of K, for Kanz (the original Kanz al-Fawaid fi tanwi al-mawaid which was “The Treasure of Useful Advice for the Composition of a Varied Table”) were used. Another from Medieval Cuisine of the Islamic World by Lilia Zaouali (ISBN: 978-0-520-26174-7). Recipes from the book with the donation of K, for Kanz (the original Kanz al-Fawaid fi tanwi al-mawaid which was “The Treasure of Useful Advice for the Composition of a Varied Table”) were used. Middle Eastern/Egyptian recipes have numerous examples of vegetable focused dishes. This is a good thing, especially when cooking for vegetarians and those people that wish to eat healthier over all. I’ve noticed over the years that many feasts and luncheons served within the Society for Creative Anachronism are very meat heavy. Perhaps there is pressure to create beef and chicken type dishes that are more accessible to the membership that isn’t too “scary” (i.e. different than what most people are used to). I do admit to having at least two somewhat familiar dishes when I am cooking for the non-adventurous eaters within my Barony and Kingdom, but I always try to throw some sort of culinary curve ball, and I’ve found vegetable dishes to be a great item to have people at least try with normally fairly good results. Here is a great vegetable side dish that works well as a sauce or a dip. 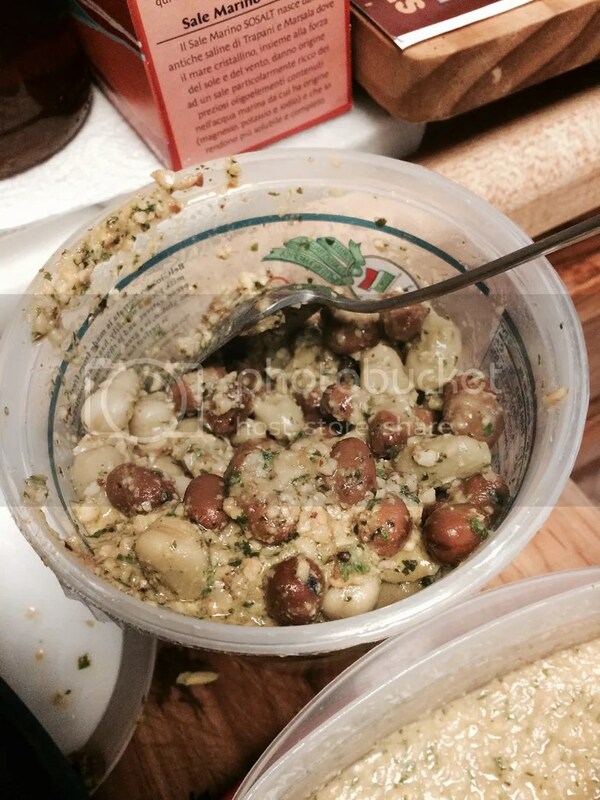 It is fairly similar to the modern baba ghannouj (which has tahini). 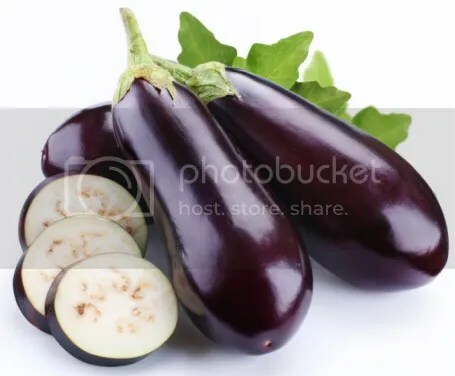 This was on page 66: “Cut the eggplant into small pieces; put them in a jar for cooking [dast] together with whole cleaned onion. Add some sesame oil and oil of good quality and a little water. Reduce over a slow fire. When the ingredients are cooked, put them through a sieve and combine with a very small clove of garlic, yogurt, and chopped parsley. Sauté diced eggplant and onions into a large cook pot using both oils and water. Reduce over a low fire until it is fully cooked and softened. 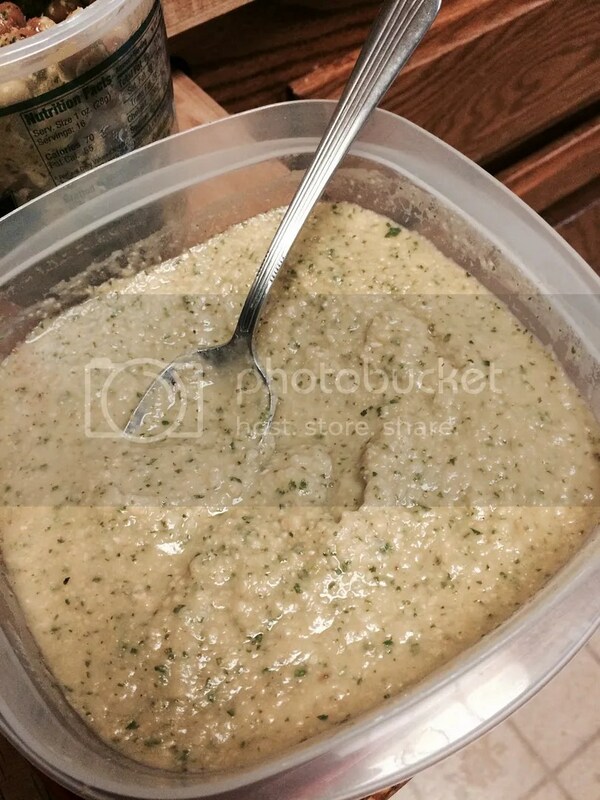 Place in blender mixture until smooth and pureed. Use cheese cloth and drain the eggplant onion mixture on it, removing as much of the water as possible. Place in bowl and mix thoroughly garlic, parsley and salt and pepper to taste. Serves 6. Here is another recipe in my series of Egyptian recipes that I found in Medieval Cuisine of the Islamic World by Lilia Zaouali (ISBN: 978-0-520-26174-7). The recipes were tagged K, for Kanz (the original Kanz al-Fawaid fi tanwi al-mawaid which was “The Treasure of Useful Advice for the Composition of a Varied Table”). This recipe in particular is great for warm weather since this is very much a cold vegetable dish. It’s also a great vegan dish. It was found on page 66 under cold appetizers. Some of the comments on this: you can use all fava beans and not bother with broad beans, or all broad beans. I did this mostly for color and texture difference. Also, the atraf-tib is a mixture of fairly “flowery” herbs and spices which is made up of lavender, betel, bay leaves, nutmeg, mace, cardamom, cloves, rosebuds, beech-nuts, ginger and long pepper. It is also safe to say that you should use what you have available. Not all of these are easily available. What I ended up using was bay leaves, nutmeg, mace, cardamom, cloves, giner and long pepper. I used 4 parts of ginger, to one part of all the other ingredients, but you may want to change these up. You also don’t need to make it if you’d prefer. Drain beans and place in large mixing bowl. In Cuisinart, place the rest of the ingredients (not the beans) in and grind that all into a smooth consistency (can be left chunky depending on your preferences). Pour mixture over beans and combine everything so that the beans are well covered. Feeds about 6. More from Medieval Cuisine of the Islamic World by Lilia Zaouali (ISBN: 978-0-520-26174-7). I looked over all the recipes with the donation of K, for Kanz (the original Kanz al-Fawaid fi tanwi al-mawaid which was “The Treasure of Useful Advice for the Composition of a Varied Table”). This one is a delicious vegan recipe. I always have problems finding tasty, vegetarian friendly, dish that can be served easily at events. This one is super easy to make and it’s zippy. It is close to a hummus, but missing some ingredients. Add all ingredients excluding the olive oil and extra garnish herbs into a blender and grind together until smooth. Sprinkle garnish across the serving plate and add puree to the dish. Add a drizzle of olive oil across the puree and serve. Serves about 6. Second dish in my series of Egyptian recipes that I found in Medieval Cuisine of the Islamic World by Lilia Zaouali (ISBN: 978-0-520-26174-7). The recipes were tagged K, for Kanz (the original Kanz al-Fawaid fi tanwi al-mawaid which was “The Treasure of Useful Advice for the Composition of a Varied Table”). This recipe was collaboration with Susan Fox. She did a lot of the figuring out on the first test. This one has a similar version of the dish served in North Africa today. 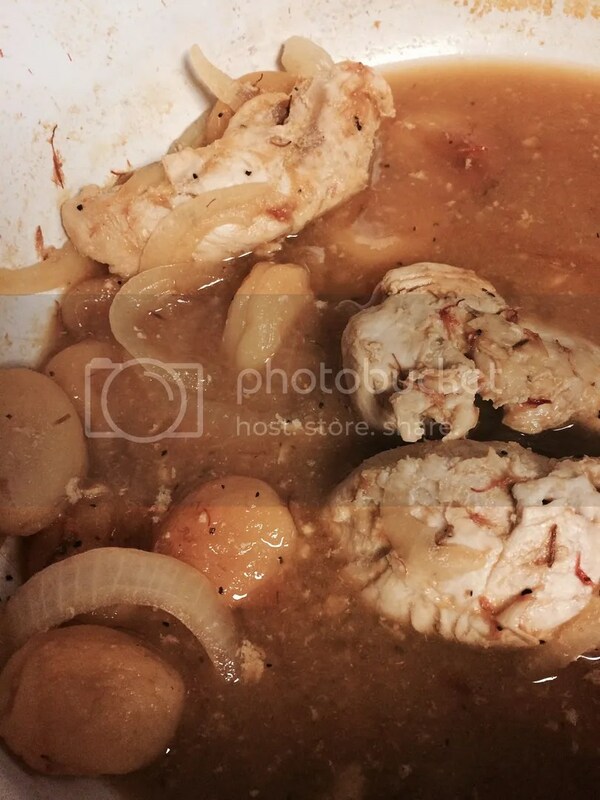 This is a very easy, sweet stewed chicken. You could easily use other “fatty” meats, like pork, lamb or goat. It would be lovely with chicken thighs. Combining sweet sauce with sweet meats or meats that can take in sweet flavors is key for this dish. The meat that was used in the original was probably a fatty lamb. I added olive oil to the recipe since I ended up using a leaner chicken thigh. Original was on page 85: “Cut some fatty meat into little pieces and put it in a casserole with very little salt. Cover with water, [heat over fire], and skim. Wash onions; cut them and arrange on top of the meat along with the most common spices. Take some fresh apricots, crush them and boil them well, then wash them and crush them by hand, strain them, and add the juice to the meat. Some cooks thicken [the preparation] with water flavored with safflower that has been crushed in the mortar and dissolved. This is a good idea. Leave [the casserole] over the fire until boiling, then wait until the boiling stops and serve. Lightly salt chicken both sides and heat up in a large pot (casserole) olive oil. Once oil is hot, add to pan and brown. Cover with water and bring to a boil, skimming any excess fat off the top. Drain water and add cut up onions, apricots, safflower and apricot juice. Bring to boil, then lower to a simmer for twenty minutes. Add salt and pepper to taste. Serves about 6. Here is the second recipe in my series of Egyptian recipes that I found in Medieval Cuisine of the Islamic World by Lilia Zaouali (ISBN: 978-0-520-26174-7). The recipes were tagged K, for Kanz (the original Kanz al-Fawaid fi tanwi al-mawaid which was “The Treasure of Useful Advice for the Composition of a Varied Table”). Drain beans and place in large mixing bowl. In Cuisinart, place the rest of the ingredients (not the beans) in and grind that all into a smooth consistency (can be left chunky depending on your preferences). Pour mixture over beans and combine everything so that the beans are well covered. Every year I try to do one major luncheon or large “meal” as it forces me to redact a bunch of new historical recipes. This year, I am doing a luncheon for the local “chapter” of the Society for Creative Anachronism (www.sca.org). My “Barony” is doing an Egyptian/Roman themed event, so I decided to try to find some Egyptian recipes since I hadn’t really done any Middle Eastern cooking myself. I figured this would make a really good change and challenge. Urtatim Al-Qurtubiyya has been very kind to point me in the correct direction of where to look. I own a number of Middle Eastern cookbooks, but I wasn’t sure which ones would be closer to Egypt rather than more of what is typical to Middle Eastern cuisine. The book I used for these recipes is Medieval Cuisine of the Islamic World by Lilia Zaouali (ISBN: 978-0-520-26174-7). I looked over all the recipes with the donation of K, for Kanz (the original Kanz al-Fawaid fi tanwi al-mawaid which was “The Treasure of Useful Advice for the Composition of a Varied Table”). 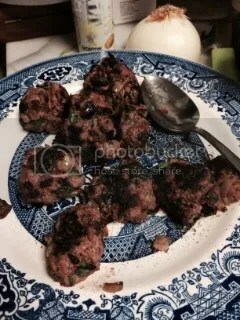 First recipe is Fried Meatballs, which was from page 87 of the text. The original said to boil until halfway cooked, and then fry. We tried frying all the way and boiling, and really there wasn’t much of a flavor difference. Probably best to bake these if you are doing a large batch of them at 350 degrees for 20 minutes (or until done, depending on the size of the meatball and your oven. The original just says “meat” and not the type of meat. I chose ground beef as this was one of the cheaper meats that were ground up. Also, the original recipe calls for the onion to be roasted. Because of time limits, we sautéed the onions in a pan of olive oil, but if you wanted to roast the onion, feel free to do so. Take chopped onions and sauté in a hot pan with olive oil. Cook those until they caramelize. Once completed allow to cool, then put in a bowl and add the rest of the ingredients. Mix until all the ingredients are evenly mixed together. Roll into balls. I made them smaller (maybe an inch in diameter) for faster cook times. Place olive oil in a pan to heat up until hot. Add meatballs into pan to brown and cook thru, rotating them for even browning. Serve.